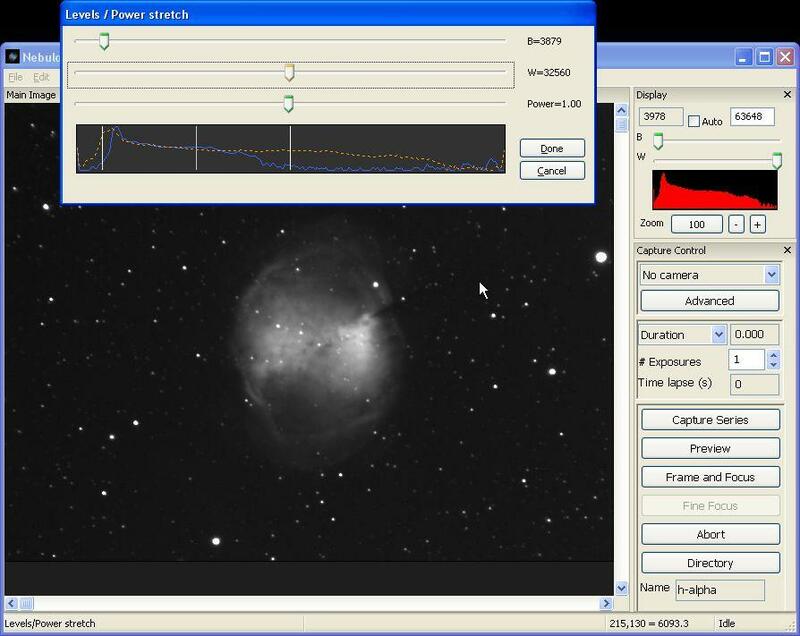 Nebulosity is an application for astrophotography - image acquisition and processing. 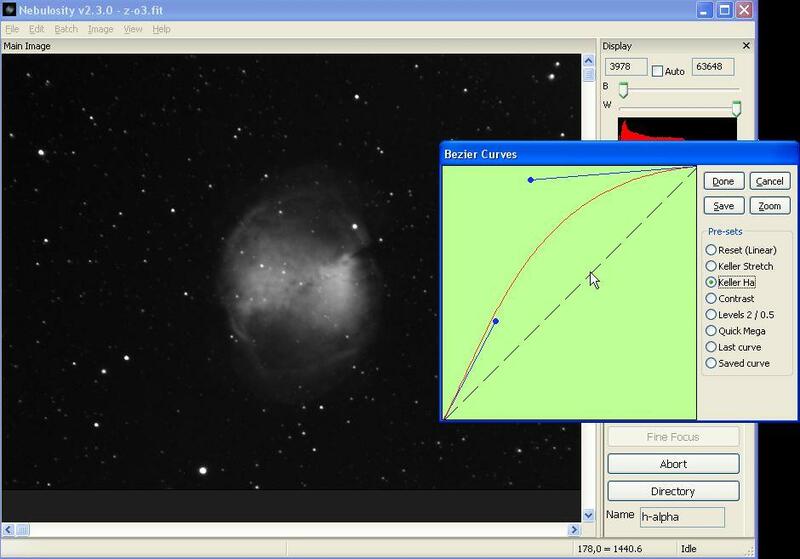 It's not free, but it's very easy to use, and supports various cameras (Atik, QHY, SBIG, SX, FLI, QSI, Meade, Moravian... DSLR). For processing it offers at least full set of "basic" features (stacking with optional rotation or scaling, darks/flats/bias support, hot pixel maps, curves, levels, colour balance etc.). For acquisition it offers very handy and clean user interface. Most of the window is occupied by the image (last image from camera or current open image). On the right you will find controls for image acquisition and display. So the frame is underexposed. For 16-bit cameras the signal is saved as a value between 0 (black, no signal) and 65535 (white). When setting exposure time it's good to get as high histogram fill as possible (brightest objects close to the max value). 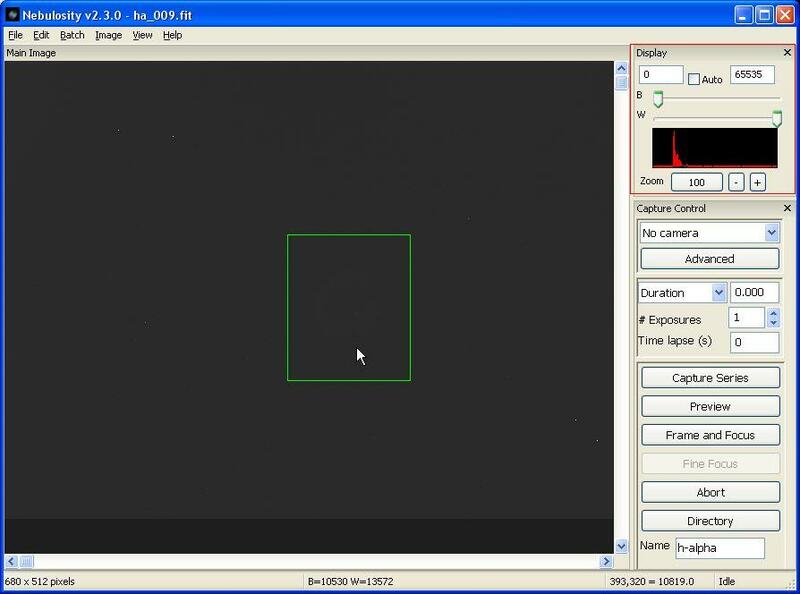 Below "Display" you will find "Capture Control" that handles camera settings - type, gain, offset, exposure time. Advanced button will allow modifying additional settings (like binning). Things like cooling may be set from the top menu ("Edit" -> "Preferences"). Directory - choose a folder to which images will be saved. Preview - do one exposure and show it. Frame and Focus - shows a binned fast preview for focusing. 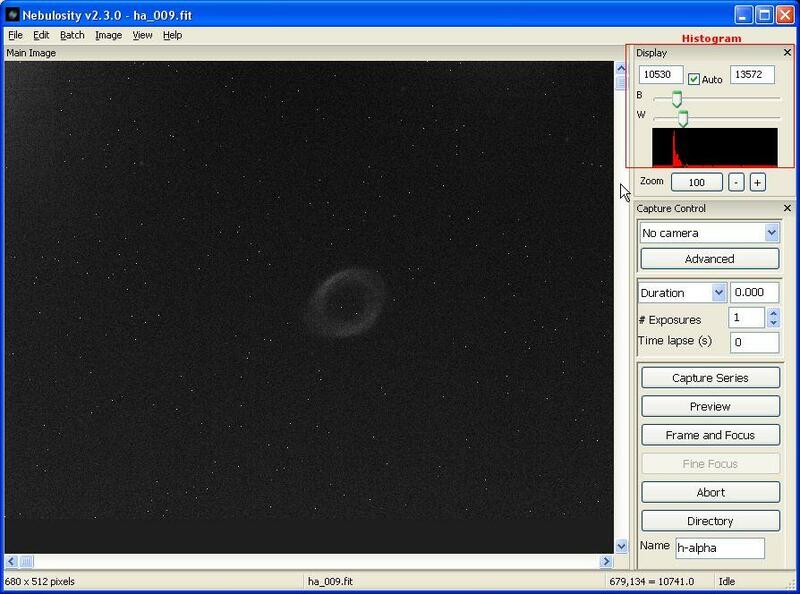 Capture Series - starts the planned imaging run (exposure time and frames quantity to capture). You can also set Name label which will be used as a frame prefix (good thing is to mark object, filter used). When you capture all required frames (light, darks, flats etc.) 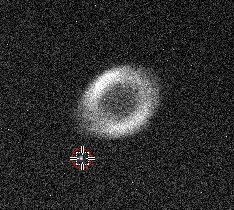 you can proceed with processing those images in Nebulosity. 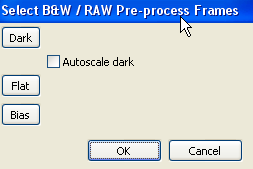 For processing the camera settings are of no meaning, but still - look at the histogram (and auto-clip checkbox). 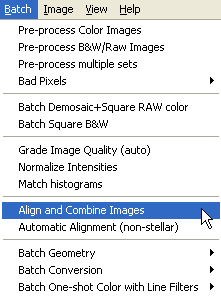 All the processing functions are in Batch and Image top menus. Pre-proces Color/BW Images - dark/flat/bias support for colour and mono images. If the camera has some (or a lot) hot pixels then dark substraction may not be as good as needed. In Nebulosity you may create a Bad Pixel Map (using the dark frame or light frame if you don't have a dark), just look into Bad Pixels submenu. You make the map with "Make Bad Pixel Map" and then you can extract bad pixels from the dark frame and from raw images (to be processed with the processed dark frame). Adaptive Median Noise Reduction may be used to limit the grainy noise. Deinterlace will be handy for removing interlacing given by interlaced CCD sensors (DSI II, QHY6, 6 Pro, Brightstar Lyuba 429 and others). To make a colour image out of monochrome R,G,B (or other) channels you need to process images for every channel. Then align them against each other ("save each file" in stacking window). 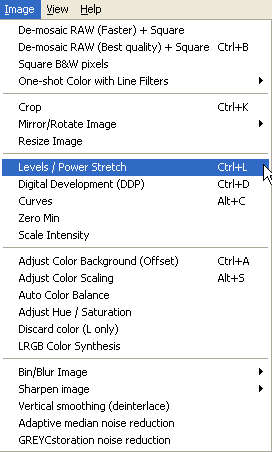 After that from Image you can choose LRGB colour Synthesis. In the window you will be able to choose frames for RGB and optionally L channels. Generated colour image may require colour balancing. Quickest and automatic path is to use Adjust Color Background and then Auto Color Balance.